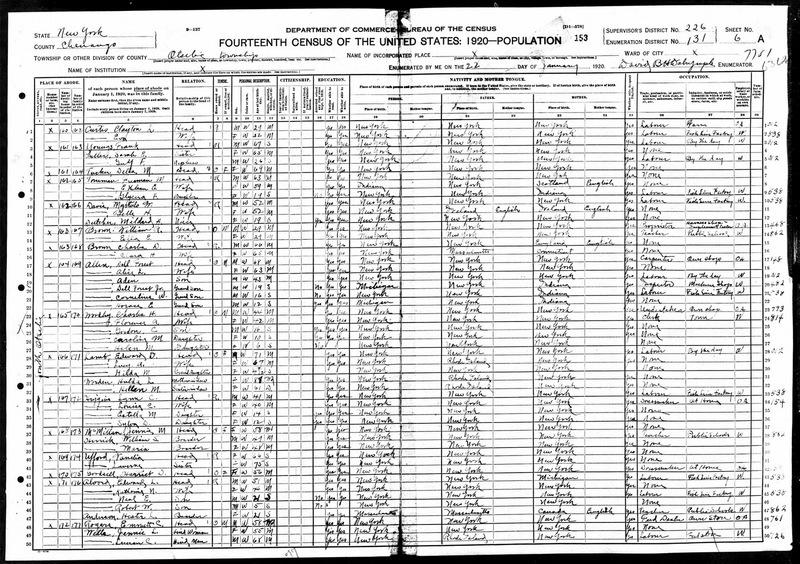 Today's post isn't about Chicago but it's about genealogy and another subject dear to my heart--fiddles and the people who make and play them. A few weeks ago a bit of insomnia brought me a couple of satisfying research finds, both fiddle-related, and today I thought I'd share one of them. On December 23, 2008, a fellow fiddler started a discussion on Fiddle Hangout titled "Who was John S. Allen?" I spent the holiday trying to answer that question. I knew that Mr. Allen had studied violin making with J. B. Squier in Boston, probably in the 1890s, and I knew that he had some connection to Battle Creek, Michigan, most likely moving there to work with Mr. Squier's son, V. C. but that was all I knew. Without an age or birth place or parent or sibling or spouse--some little something in addition to the name--I exhausted most all of the options I had and finally gave up the search. Recently a Fiddle Hangout member who had seen the archived thread sent me some information on the Squiers and somehow in that I-can't-really-explain-what-prompted-me-to-do-that sort of way, I typed "john s allen" into FamilySearch. 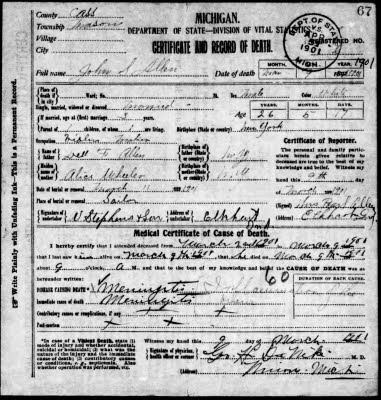 I glanced at some Michigan death results, clicked through on a few, and all of a sudden found myself staring at a name and an occupation: John S. Allen, violin maker. He died of meningitis in Mason, Cass, Michigan on 9 Mar 1901. I don't know that this is the right man, but I think there's a very good chance that he is. 1) This man was born in New York. It's reasonable to think he might have learned his craft from a Boston master. 2) He died at the age of 26. That would explain why so little seems to be known about him. He didn't live long enough to become a well-known maker. If this is the right man, then one of the violins he made, number 58, was finished in 1896 when he was a pupil of Mr. Squier. 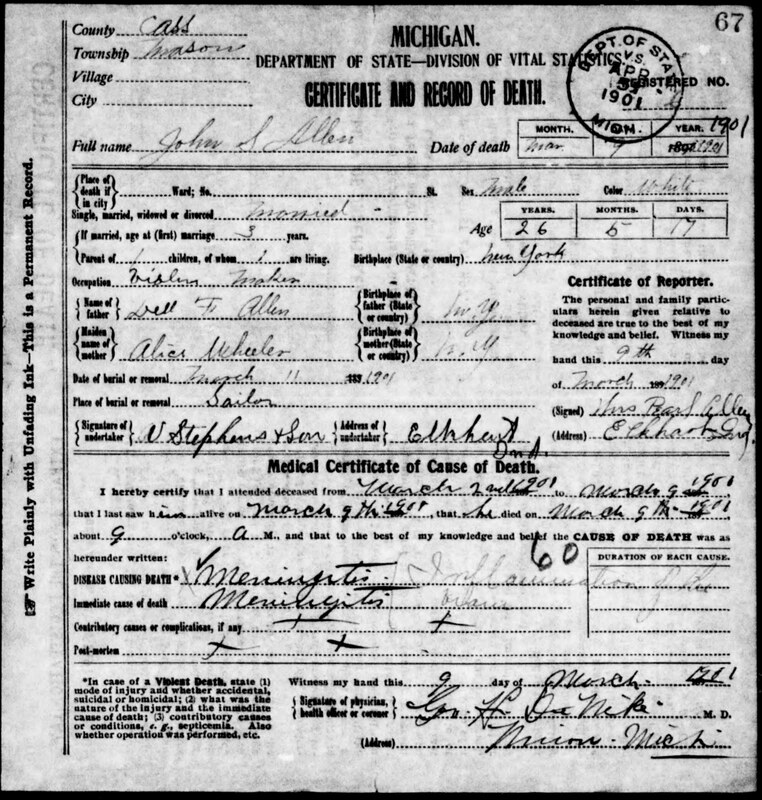 If the death certificate is correct, John was born in 1874 which means he would have been 22 at the time. 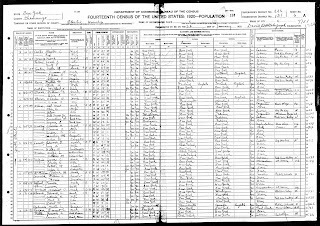 Further research tells me that John and his wife Pearl had a son Dell F. Allen, born 16 Dec 1900 in Mason. In 1920 Dell was living with his grandparents, Dell Forest and Alice L., in Chenango County, New York. 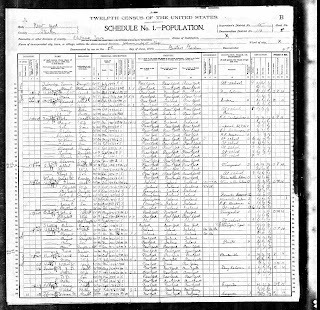 The Social Security Death Index suggests that he died in Colorado in August of 1955. Perhaps someday I'll find the time to learn more about Mr. Allen and his violins. If you happen to play one or if you happen to know the family, I'd love to hear from you. 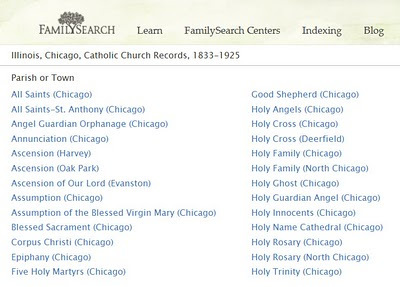 You can now browse Archdiocese of Chicago Catholic church records online for free at FamilySearch and because the Archdiocese includes nearby towns, you will also find records for places like Oak Park, Evanston, and Cicero. To access the images, you'll need to log into FamilySearch but if you don't already have an account, no worries. It's quick and easy to sign up and it's free. 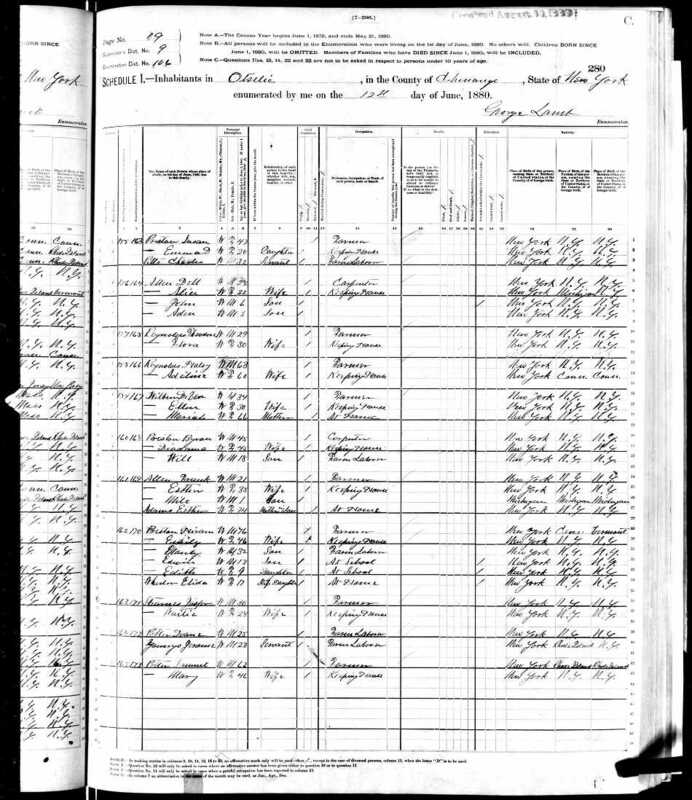 To find the images, go to FamilySearch, click on "US, Canada, and Mexico" under "Browse by Location," and scroll down to "Illinois, Chicago, Catholic Church Records, 1833-1925." 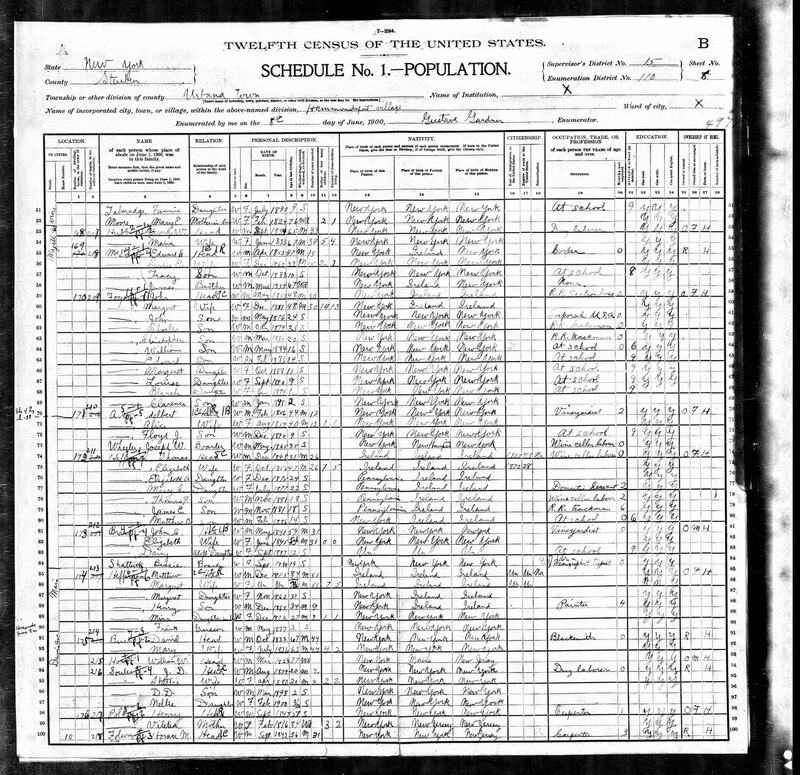 These records were digitized from Family History Library microfilm and even though the date in the title goes to 1925, you'll find that the records for most parishes end with 1915. That was the cutoff year when the records were filmed. So, here are some tips for accessing the records. 1) Many of the books have index pages in the front. 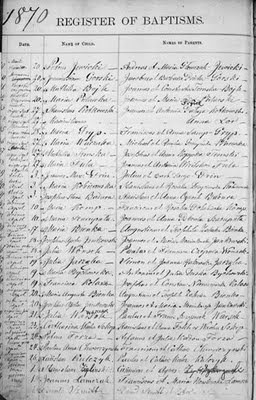 2) If you're not sure which parish to search, locate the family's address in a city directory or on another record, a birth certificate, for example. 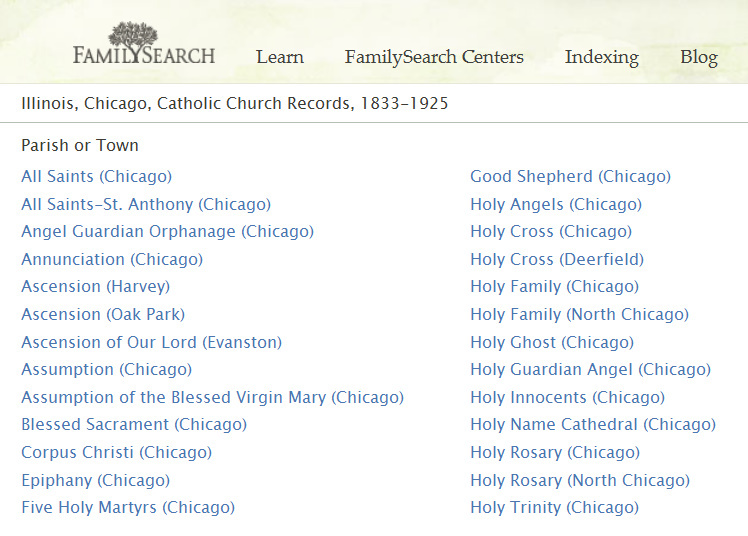 Then use that address with the search tool at ChicagoAncestors.org to find out which parishes were close to the address. 3) If you're looking for a marriage register entry, find a copy of the marriage license first. Many will list the parish name. If the record doesn't, find the priest in a city directory to see where he was serving, or if it's an early marriage, try searching my priest/parish database for ideas. 4) It's helpful to narrow parishes by ethnicity. I usually use the list at POINTers in Person for that purpose. Eventually, these records will be indexed, but in the meantime, happy searching. As I mentioned in my previous post, I'm determined to contribute some time to indexing Chicago's Catholic parish records because I think it will create a much-needed resource for pre-Fire research and this morning I'm working on a page from a Polish church. 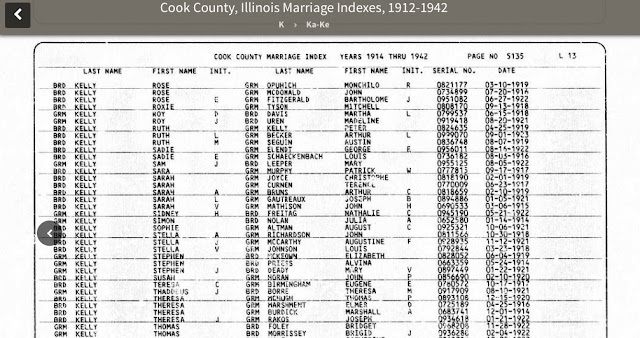 I'm familiar with the records and I've even bumped into a lot of Polish surnames in 5+ years of working with Chicago vital record searches but I'm still struggling to read some of the names. The "kowiak" was clear but was the surname really Autkowiak? It just didn't feel right. 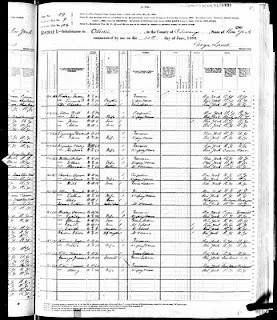 I went to the Polish Genealogical Society of America (PGSA) website and pulled up the Dziennik Chicagoski Death Notice Index Search 1890-1929. I typed "kowiak" in the surname box, chose "wild card search" and hit enter. In this case, the answer to my question was on the first page of results. Antkowiak. Of course! I know that "n" and "u" are often misread but it's so easy to forget when I'm reading names that are unfamiliar. I suspect this database will prove to be a huge help as I work at accurately transcribing other names. If you have other insights that will help make this project easier for other indexers, please post them as comments. and the resulting index will give us powerful new ways to access these records. Why is the project so important? Just off the top of my head . . .
1) It will create an index to pre-Fire Catholic deaths. 2) It will create a multi-parish index to pre-Fire Catholic births. that wouldn’t have been the “logical” choice. I don’t have a lot of free time—we are working very hard to meet our goal of having the new version of Genlighten.com ready for public beta by the site’s two-year anniversary this coming October—but I will do my best to contribute. One of the things I’ve noticed searching for Chicago death records at FamilySearch is that there transcription errors that sometimes make it hard to pull records out of the database. This is inevitable, completely understandable, and I’m grateful to indexers who did their absolute best to decipher those hard-to-read records. But, as this new project begins, I’d encourage Chicago researchers who have experience working with the Catholic records and a familiarity with Chicago surnames to join in the project. I’m thinking the more pages that are indexed by people from the Chicago research community, the better the index will be. And to that end, I’ve been thinking how much fun it would be to have a FamilySearch indexing party. I picture friends gathering around a table, laptops plugged in, batches downloaded and ready to go. Along with the clicking of computer keys, there’d be the occasional, “Please pass the chocolate-covered cashews?” and “Can anyone tell what this letter is?” Have any of you ever tried that? Was it fun?